Nucleons consist (left) of quarks (matter particles) and gluons (force particles). A glueball (right) is made up purely of gluons. Scientists from Vienna University believe they may have discovered the long-sought-after glueball, a particle composed of pure force. For decades, scientists have been looking for so-called “glueballs”. Now it seems they have been found at last. A glueball is an exotic particle, made up entirely of gluons – the “sticky” particles that keep nuclear particles together. Glueballs are unstable and can only be detected indirectly, by analyzing their decay. This decay process, however, is not yet fully understood. Protons and neutrons consist of even smaller elementary particles called quarks. These quarks are bound together by strong nuclear force. “In particle physics, every force is mediated by a special kind of force particle, and the force particle of the strong nuclear force is the gluon”, says Anton Rebhan (TU Wien). In 1972, shortly after the theory of quarks and gluons was formulated, the physicists Murray Gell-Mann and Harald Fritsch speculated about possible bound states of pure gluons (originally called “gluonium”, today the term “glueball” is used). Several particles have been found in particle accelerator experiments which are considered to be viable candidates for glueballs, but there has never been a scientific consensus on whether or not one of these signals could in fact be the mysterious particle made of pure force. Instead of a glueball, the signals found in the experiments could also be a combination of quarks and antiquarks. Glueballs are too short-lived to detect them directly. If they exist, they have to be identified by studying their decay. “Unfortunately, the decay pattern of glueballs cannot be calculated rigorously”, says Anton Rebhan. Simplified model calculations have shown that there are two realistic candidates for glueballs: the mesons called f0(1500) and f0(1710). For a long time, the former was considered to be the most promising candidate. The latter has a higher mass, which agrees better with computer simulations, but when it decays, it produces many heavy quarks (the so-called “strange quarks”). To many particle scientists, this seemed implausible, because gluon interactions do not usually differentiate between heavier and lighter quarks. Anton Rebhan and his PhD-student Frederic Brünner have now made a major step forward in solving this puzzle by trying a different approach. There are fundamental connections between quantum theories describing the behavior of particles in our three dimensional world and certain kinds of gravitation theories in higher dimensional spaces. This means that certain quantum physical questions can be answered using tools from gravitational physics. “Our calculations show that it is indeed possible for glueballs to decay predominantly into strange quarks”, says Anton Rebhan. Surprisingly, the calculated decay pattern into two lighter particles agrees extremely well with the decay pattern measured for f0(1710). In addition to that, other decays into more than two particles are possible. Their decay rates have been calculated too. Up until now, these alternative glueball decays have not been measured, but within the next few months, two experiments at the Large Hadron Collider at CERN (TOTEM and LHCb) and one accelerator experiment in Beijing (BESIII) are expected to yield new data. “These results will be crucial for our theory”, says Anton Rebhan. “For these multi-particle processes, our theory predicts decay rates which are quite different from the predictions of other, simpler models. If the measurements agree with our calculations, this will be a remarkable success for our approach.” It would be overwhelming evidence for f0(1710) being a glueball. And in addition to that, it would once again show that higher dimensional gravity can be used to answer questions from particle physics – in a way it would be one more big success of Einstein’s theory of general relativity, which turns 100 years old next month. 2 Comments on "Glueball – A Particle Purely Made of Nuclear Force"
How remarkable!! LOL. After spending billions of dollars scientists are now recognizing that matter is made of energy. At the subatomic level electromagnetism accounts for everything we see. Interestingly, it accounts for everything we see at the galactic level as well. The process of realizing that the entire universe is an electromagnetic phenomenon has been slow but is finally breaking through. Once cosmologists get rid of their gravity based blinders, a grand unified theory of everything will become a realistic goal. A fantastic discovery of ‘gluons’ into ‘glueballs’ which glue the ‘quarks’ to configure neutrons and protons, the fundamental stable particles of all the matter in this world. 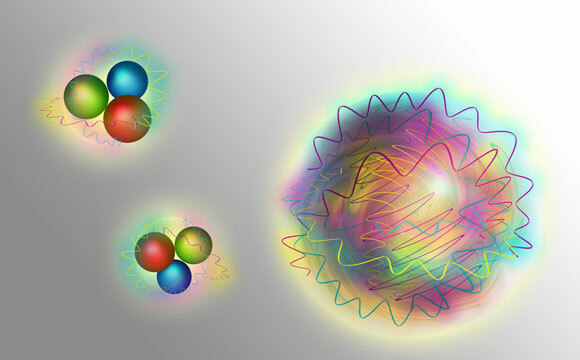 Three quarks are required to form a stable nucleon and two quarks can make only an unstable ‘meson’, with the help of gluons which offer ‘color forces’ red, green and blue and their complimentary in addition to electric charges. But, if gluons are stretched by more distance, they will immediately transform into ‘particles’ of quarks to account for their energy transformation. GLUONS by themselves are invisible BOSONS with additional special characters of color forces and electric charge which is very highly more powerful than the electrostatic forces of electrons, and that is responsible for binding of protons together against their repulsive electrostatic forces in the nucleus of the atom. We can compare here with a weak electro-weak field ‘W Bosons’ of three kinds (W=, W- and Z Bosons) that can be considered, where these Bosons also transform into electrons and positrons on decay into stable particles. Thus BOSONS and HARDONS are interchangeable, Where gluons are very strong fields combined with color field ,only short acting, W Bosons are weak electric field. I COMMEND THE DISCOVERY OF THIS INVISIBLE GLUONS INTO GLUEBALLS ..Thank You.